I just said goodbye to my Volkswagen Passat "sport" wagon. I know, in the scheme of the world, it's exceedingly non-important but man, I had no idea how attached I had become to that silver lady until the tow truck recently shlepped it off. I never learned to drive or owned a car as a teenager. It was a rite of passage I missed (worthy of its own blog - another post, another time) and it never really bothered me. It wasn't until I met Fred at the ripe old age of 19 that I realized what I had missed. Bonding over our mutual love of music, he mused of the sheer awesomeness of getting in the car, driving along, and turning up some serious jams. I had experienced some serious jams in my ears through my discman while walking through Boston for many years but the appeal of experiencing it by myself in the confines of my own car intrigued me. Like Jon Bon and Richie, I wanted to see a million places in my car and more importantly - rock them all. Almost ten years after meeting Fred and having that powerful conversation, I found myself pregnant with my first prince. I was back living in my hometown of LA after having stinted there a previous time, along with the aforementioned Boston and the home that lives in my heart, New York City. We were settled into the Valley and we needed a car. A good one. Any musician's wife/girlfriend/boyfriend knows a hatch back is essential to stowing gear, especially drums and cymbals. A station - er, sport - wagon seemed like a logical choice. We meandered over to VW on Van Nuys Boulevard, spotted a silver Passat wagon, and gave the salesman the easiest transaction of his career. I drove it once around the block, handed him a deposit check, and off we drove. The sound system was killer as Fred is wont to say. Driving over Laurel Canyon, I finally got to experience what he had lovingly described so many years before. Nada Surf's "Inside of Love" sounded like a gospel. Amen! Incidentally, who knew the band that made the atrocious Weezer rip-off "Popular" could become so, well, killer? Despite only running on premium gasoline, it was a great car. It brought us to and from Cedar's Sinai as we welcomed both of our boys into the world. Ryan Adam's "La Cienega Just Smiled" was a tear filled lullaby as I sat in the backseat next to my almost ten pound biscuit Cooper James. Those rides were the scariest. Good thing I had all that quality German engineering encasing me and my expanding family. 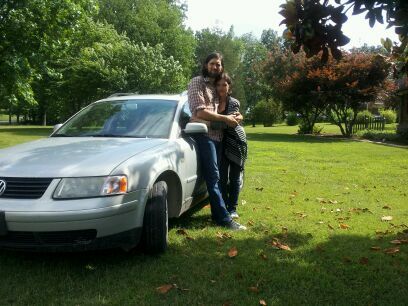 It also drove us here to Nashville where it seamlessly parked in the driveway of our first house that we bought. It drove me as well to my first serious yoga practices, that have since shaped my world. Thinking about all these moments makes me emotional and a little bit fahrklempt. I fought back tears as the tow truck pulled up and I could not watch as it drove off. I did love that car. But it's the experiences surrounding it that I love more. I don't have to worry about detaching from them because I can carry them with me forever.